Food is our passion, we want your wedding guests to enjoy a memorable, exciting and beautifully presented meal at your wedding but marquee wedding catering isn’t just about the food. Behind the scenes you need to know that your marquee wedding caterers are seasoned professionals, masters of logistics and planning, capable of creating a state-of-the-art catering kitchen from scratch at any location. Your marquee caterers need to have an ensemble of reliable and friendly waiting-on staff, bartenders, chefs and catering managers all eager to get it right for you. We have over 50 years’ experience in marquee wedding catering and we have the resources and personnel to deliver your dream wedding breakfast. Marquee weddings offer you total flexibility, if you have the right location and surround yourself with supportive, experienced and reliable suppliers you can do pretty much anything! A marquee wedding is the obvious choice for a large wedding where most of the wedding venues you like can’t accommodate your numbers. Some of the wedding venues we work with will let you erect a marquee in their grounds for your wedding reception but we have also catered at many marquee weddings held at the parental home. If you’re hiring a marquee or tipi for your wedding then introduce us to your marquee or tipi suppliers as soon as you can. 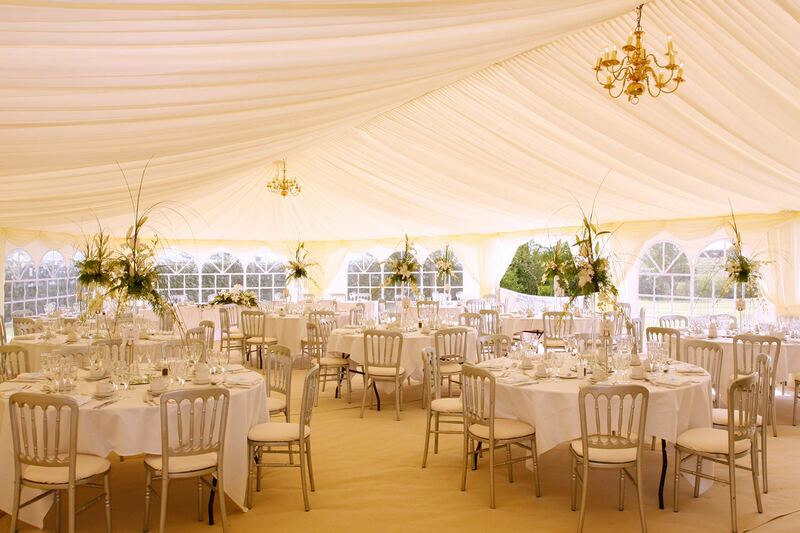 Using the benefit of our extensive experience, we can help design the layout of the marquee so that it works seamlessly. We’ll make sure that the kitchen gets located in the optimum position to ensure the smooth service of your wedding breakfast, we’ll also be able to advise the best layout to minimise the visibility of the kitchen area. Whatever theme you choose be assured that we’ll work with you to design and incredible and memorable wedding breakfast. As experienced marquee wedding caterers we’ll be able to advise you on what dishes are most suited to a marquee wedding, where we may face certain culinary and logistical challenges not associated with a permanent venue.